Sometime you’d want to remember sizes, links or any other options for rendering a plugin instance across the project. In order to not have to do this job for each managed entity, you can remember these settings using a name of your choice, controllable in a special section of the administration backend. Now, whenever someone adds a new instance using this plugin, a select box with these remembered settings appears. He then can choose from one of the remembered settings, which frees him to reenter all the values. 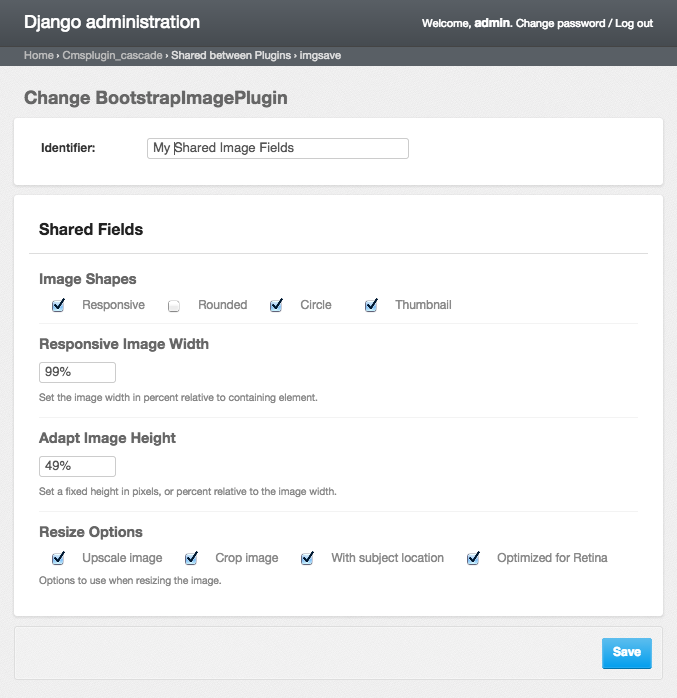 Configuring a plugin to share specific fields with other plugins of the same type is very easy. In the projects settings.py, assure that 'cmsplugin_cascade.sharable' is part of your INSTALLED_APPS. Then add a dictionary of Cascade plugins, with a list of fields which shall be sharable. For example, with this settings, the image plugin can be configured to share its sizes and rendering options among each other. By choosing a previously named shared settings, the configured fields are disabled for input and replaced by their shared field’s counterparts. In this editor one can change these shared settings globally, for all plugin instances where this named shared settings have been applied to.